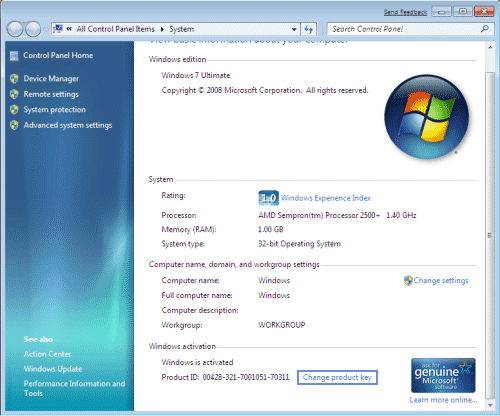 Do you need to change Windows product key so you can activate Windows 7 or Windows Vista properly? Sometimes, users are required to change or re-enter the product keys in Windows 7 or Windows Vista to solve and fix activation problems, or after buying a genuine license for Windows operating system, it’s necessary to reactivate Windows. This article shows you 2 methods to change or re-enter product key that already installed in the system. Right click on My Computer and select Properties. Wait a second for windows activation details to get populated. Click on Change Product key link after your Windows activation details are populated. Enter new product key and click on next to activate your Windows 7 or Vista. If you misplace or lost your Windows product key, you can recover Windows product keys for your local computer using Product Key Finder program.